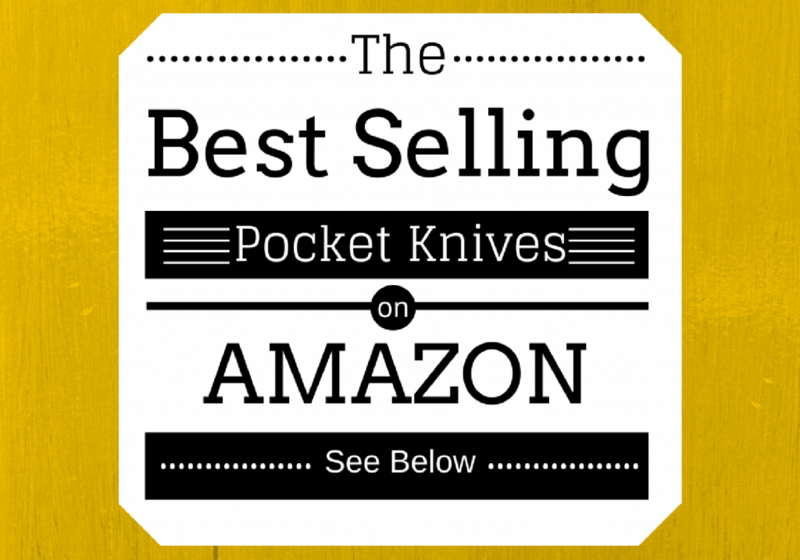 You are here: Home / Pocket Knife / What’s the Best Multi Purpose Pocket Knife? Each day before work, I go over to my dresser and pull out the wooden box in which I keep my EDC knives. Staring into the box (admittedly, I do this before coffee, so it takes some mental effort), I try to determine what functions I may need before grabbing the knife I intend to take with me. Do I need to work on the wiring in my new office? Will I be taking a hike through the woods? 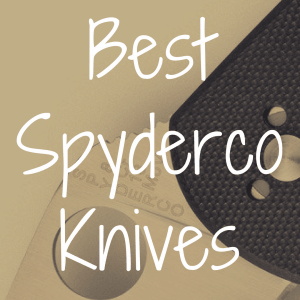 In this article, I’m going to help you figure out the best multipurpose pocket knives currently on the market, so that you can know what blades to focus your attention on most. 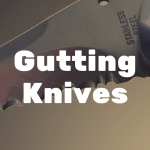 To better help you, I’ve provided an interactive table below full of great knives that I think really work as being excellent multipurpose blades—no matter your needs. A multipurpose knife needs to have certain key elements to be functional and efficient. First, it should have a quality blade. If the blade fails the user, then no other aspect of the knife will redeem it. The knife should also have a quality handle. It only takes one emergency room visit to remind one of how important a handle with grip is for safe use. The user should be open the blade with one hand (ideally; some knives are good enough to merit an exception). The knife should be there to assist the user, not dominate their efforts, and one-handed opening goes a long way to do so. An excellent multipurpose knife should have at least one screwdriver, preferably two (one flathead and one Phillips-head). Pliers are also essential. This is the natural compliment to the screwdrivers, and pliers are able to accomplish a wide variety of tasks, from turning the knife into a pot handle during a campout to stripping wires on a stereo system to removing bolts from a rusty lawnmower. Finally, the knife should have decent aesthetics. While form may follow function, it should still be present. While a good knife that has extraneous components should not be avoided per se, a knife with a saw blade, corkscrew, magnifying lens, or the like is just adding weight to your kit. Consider whether a knife that has these features is the right knife for you. SOG may be one of the few manufacturers of multi-tool knives to go above and beyond lower quality 420 alloy steel. SOG instead uses the higher quality 5Cr15MoV alloy (no comparison is possible with respect to Gerber’s Diesel, as the manufacturer only reports it is made of stainless steel). Regarding blades and tools, the Powerplay has both a straight edge blade and a fully serrated blade. The Powerplay also has pliers that utilize a gear mechanism to increase the relative torque applied, a feature no other multitool manufacturer offers. It also comes with a full set of hex and star bits that are additional purchases with other manufacturers. SOG designed the Powerplay for one-handed opening of its knives and tools, which is definitely desirable when you are working off the ground, and want to keep your hand on the ladder or scaffolding. Overall, SOG’s Powerplay is the most well-designed multitool on the market. The Leatherman Skeletool CX is Leatherman’s minimalist multitool, intended for light hikers. It comes with a bit driver, straight edge knife, pliers, and a carabiner/bottle opener, but its real value is what it does not come with: unnecessary weight. While Leatherman does use 420 steel on other knives, it uses 154CM steel alloy on the Skeletool CX, the same alloy used by Benchmade on its high-end knives. While other alloys rely on a larger distribution of Carbon throughout the metal, 154CM instead relies on an increase in Molybdenum, which offers increased strength and corrosion resistance. The design of the Skeletool is excellent given that Leatherman seems to be more content with blocky shapes and straight lines on most of its other multitools (i.e., the Leatherman Wave). The knife has a thumbhole for one-handed opening that also works as a cleat wrench for those who work on the water. The blade itself is a well-shaped, easy to sharpen design. It is worth looking back at one of the most classic multipurpose knife designs, the Victorinox Deluxe Tinker Swiss Army knife. 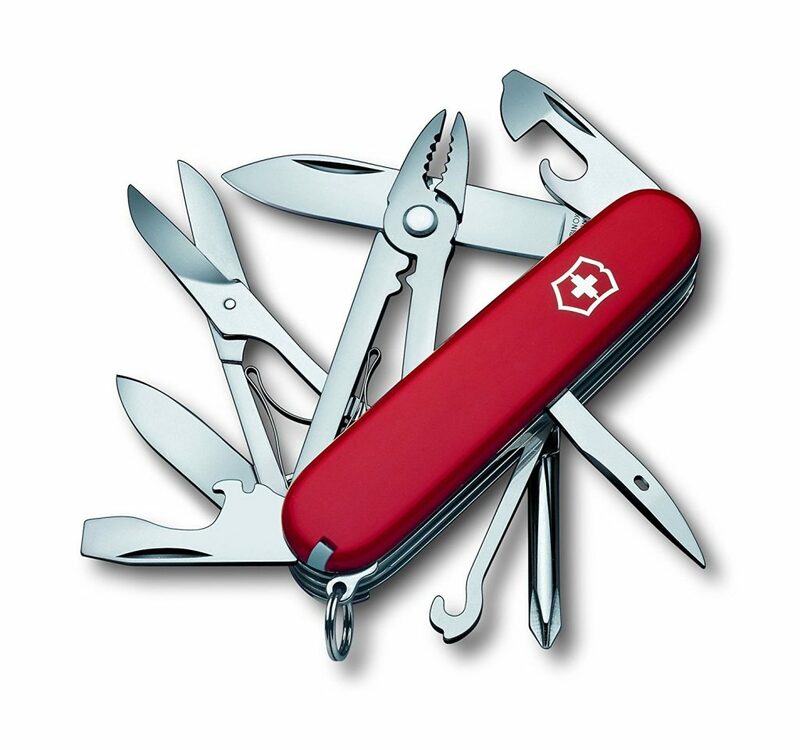 The Tinker line of Swiss Army Knives has been around for decades (and Victorinox’s Swiss Army Knives have been around for more than centuries), and the Deluxe Tinker updated on the design of the Super Tinker by adding a small set of pliers to the knife. While this addition seems minor, it made the Tinker comparable concerning functionality to the Leatherman and Gerber multitools. What the Tinker does lack that the SOG Powerplay, Leatherman Skeletool, and CRKT Bivy possess is the ability to be opened and operated on an entirely one-handed basis. 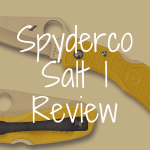 If the one-handed operation of the knife is a deal breaker for you (and for some, it may reasonably be so, especially if they work on ladders), the Tinker is just not the best knife for your needs. Additionally, the pliers on the Tinker could not be considered more than an occasional-use tool. If the primary reason for purchasing the knife is for the pliers, the Powerplay, Skeletool, or Bivy are better bets. The Deluxe Tinker may not be the fanciest multifunction knife or be made of groundbreaking new materials. However, it is a classic design in a smaller form factor than even the streamlined Leatherman Skeletool. For those that want a multipurpose knife that is still a minimalist knife, the Kershaw Shuffle family of knives might be a great option. The Kershaw Shuffle DIY (which was debuted at Shot Show 2017) offers an 8Cr13MoV alloy blade and a bit driver at the rear of the knife. The Kershaw Shuffle II has a bottle opener/flathead screwdriver in lieu of the bit driver, as does the Kershaw Shuffle I (although the design of the Shuffle II was a vast improvement on the design of the Shuffle I). Both the Shuffle II and the Shuffle DIY have 8Cr13MoV alloy blades in a leaf design similar to that used by Spyderco on its Chicago and Cat knives. Unlike either Spyderco knife, the Shuffle tends to retail somewhere between $15 and $20 USD, making it far more affordable. However, that comes at the cost of lacking a more robust number of tools, pliers in particular. One final thing is worth mentioning with the Shuffle II: the ergonomics of its scales. While the Shuffle II is a tiny knife to me, its handle is still exceedingly comfortable due to the ergonomic finger grooves in the scales. 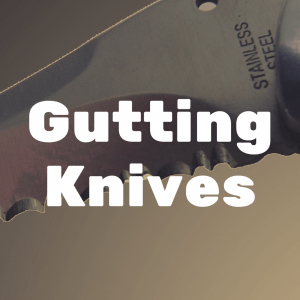 You may also want to read our article entitled: What’s the Best Kershaw Pocket Knife? The CRKT Bivy may be the most eccentric looking multifunctional knife on this list, but it is also the only one to have a full-size set of pliers and tactical knife blade. Designed by a renowned speed climber, Hans Florine, the Bivy is intended to be opened with one hand, meaning that a climber could access the pliers or blade while tied in on a rock face. It also means that “Average Joes” can flip open the pliers with one hand while underneath a sink, dealing with leaky plumbing. The blade of this knife is an unusual specimen on a multipurpose tool: a knife that is worth using in its own right. The 5Cr15MoV alloy tanto-style blade is an excellent self-defense weapon, even if smaller than most self-defense blades. It has a partially-serrated edge. The other tools on the knife – a marlinspike, a flathead screwdriver, and a Phillips-head screwdriver – are actually of usable strength (on some multipurpose knives, such as one issued to me by the US Army, the tools are not suitable for regular use, leading to stripped screwdriver heads and warped pliers). Some have complained that the Bivy is overly heavy for being a climbing tool. CRKT reports that the Bivy weighs 7.7 ounces, so if that is too much, it also means that the SOG Powerplay, at 8.1 ounces, is also too much, and likely an ultralight tool like the Skeletool or Shuffle II is needed. 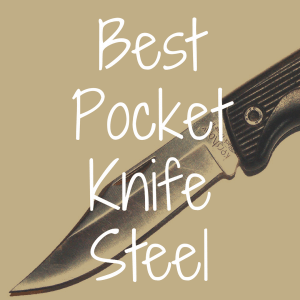 What’s the Best Folding Hunting Knife? What’s the Best Spyderco Knife?